REMEMBER: ALL MONEY COLLECTED GOES TO THE MUSICIANS! PLEASE CLICK ON THE LINK BELOW! Although the irreplaceable trombonist and singer Vic Dickenson recorded frequently for almost fifty years (his discography stretches from the sweet plaintive vocal on the Luis Russell HONEY, THAT REMINDS ME in 1931 to his last recorded performances in 1983), it never seems like too much. Or even enough. I speak as someone who followed Vic around in New York City with a variety of tape recorders and once, a camera — between 1969 and 1981. Occasionally he could offer a well-polished solo on BASIN STREET BLUES or IN A SENTIMENTAL MOOD, but he always gave us surprises — whether he was being hilariously non-verbally seductive or slyly making tears come to my our with a ballad. 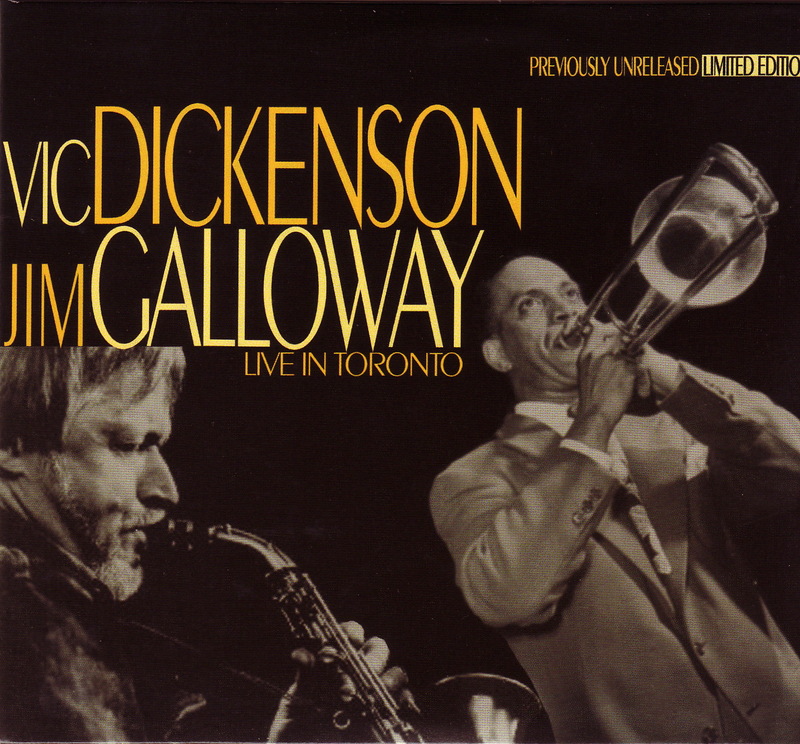 But all this serves as prelude to announce a wonderful new CD by Vic with Jim Galloway, music recorded live in Toronto in 1973. I bought my copy as soon as I heard about the disc: I needed to hear Vic play ZING WENT THE STRINGS OF MY HEART — and I wasn’t disappointed. To purchase a copy: Email buymusic@jimgalloway.ca. Canada – $20 plus $3 shipping ($23 CAD). Europe/International – $5 shipping ($25 CAD) (approx 18 euros).